Upon entering the Meiji era, soy sauce finally became a mainstay as a necessity in the lives of the common people and its consumption increased. At the same time, advances were made in mechanizing the brewing process, which had entailed a good deal of manual labor elements. It was around 1893 when the 10th generation Gihei Yamaguchi, Goto, took over the family business that Yamasa Soy Sauce embarked upon the path of modernization. Goto, who was touted as the soy sauce king of the world, researched and incorporated industrial ideas to make environments more friendly for microbes to carry out their functions on top of incorporating an agricultural concept of relying on the power of microbes for brewing soy sauce. While continuing to maintain the standard quality built up by the first generation Gihei Hamaguchi, he contributed to the advancement of modernization in the soy sauce brewing industry. In order to scientifically investigate soy sauce brewing, which relied on intuition and experience, Yamasa Soy Sauce established a soy sauce research center in the Meiji era. Ever since, the research center with its over 100-year long history has focused its efforts on improving the “Yamasa fungus” (“koji”, a kind of fungus used to ferment soybeans) — the key to the Yamasa soy sauce taste — and it has produced outstanding researchers along with giving rise to several new discoveries and inventions. Today, the research center contributes not only to the world of soy sauce, but is also making significant contributions to the world of bio-technology. 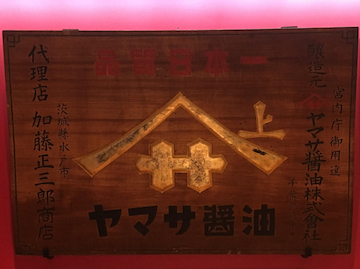 Yamasa Soy Sauce’s quality was recognized in 1895 and selected as Kanto’s first puveyor to the Imperial Household Ministry (the modern-day Imperial Household Agency). In 1893 when Goto took over the family business, Yamasa Soy Sauce’s production output was around 720 kiloliters. Afterwards, with the mechanization and renewal of plants and equipment, along with mergers and acquisitions such as the Choshi-based soy sauce manufacturer, Yamaju Soy Sauce, Yamasa’s production output expanded thirty-fold in 1928, 35 years later. In November 1928, the company name was changed from what had been Hamaguchi Gihei Shoten to Yamasa Shoyu Co., Ltd. on the occasion of corporate stock organization restructuring. While at the time a great deal of companies used location names or leaders’ names as the company name, Yamasa boldly used its trademark (product name) as the name of the company, which remains the company name today. In 1893 at the ripe young age of 20, Goto inherited the family business and promoted the further development of Yamasa Soy Sauce for the 50 years until 1943 when he drew the line. Right after the 10th generation took over, he requested and purchased the facilities and land of local soy sauce makers, massively expanding sales routes through advertising amid heavy concerns over the Sino-Japanese war. Then, the soy sauce industry continued to boom during the first world war and the 10th generation Hamaguchi Gihei had the main store and research center built new. Conversely, during World War II amid the crippled, controlled economy that was tied down by the rationing system, Yamasa maintained robust management.